The letter, which was signed by 47 Republican senators, stated that even if Iran managed to come to an agreement regarding the country’s nuclear interests with Barack Obama, the deal may only last as long as the current US president is in power. In a meeting with Iranian President Hassan Rouhani and other clerics, Khamenei said he was dismayed with the behavior of some Americans as when progress is made, the US became “harsher, tougher and coarser,” the Mehr news agency reported. "Every time we reach a stage where the end of the negotiations is in sight, the tone of the other side, specifically the Americans, becomes harsher, coarser and tougher. 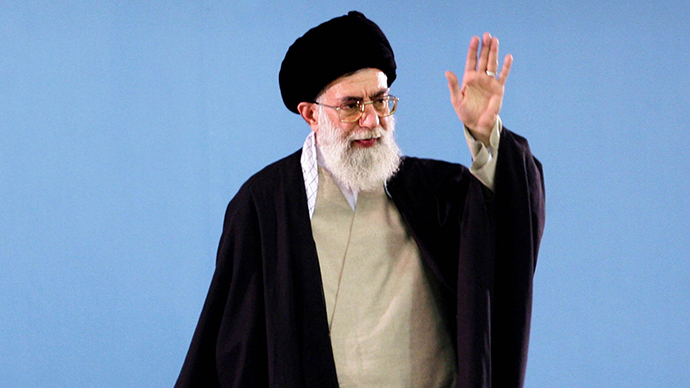 This is the nature of their tricks and deceptions," the news agency reported Khamenei as saying. US Secretary of State John Kerry also hit out at the Republicans for sending the letter, adding that they would not be able to modify any deal that was struck between the US and Iran. "When it says that Congress could actually modify the terms of an agreement at any time is flat wrong," Kerry, who has been negotiating a deal to rein in Iran's nuclear program in exchange for easing sanctions, told the Senate Foreign Relations Committee on Wednesday. "You don't have the right to modify an agreement reached executive to executive between leaders of a country." The White House declared the letter as “reckless” and “irresponsible,” adding that it was interfering with their efforts to try and prevent Iran from building a nuclear weapon. "We have been clear from the beginning, we are not negotiating, a quote, legally binding plan, we are negotiating a plan that will have in it capacity for enforcement," Kerry said. "The letter erroneously asserts this is a legally binding plan. It is not. We don't even have diplomatic relations with Iran." Iran insists it has no nuclear weapons ambitions and seeks enrichment capabilities to develop reactor fuel, and for other peaceful purposes, while adding Tehran has a right to develop a nuclear program for peaceful purposes. However, the West believes Tehran has been using its civilian atomic energy program as a cover for developing a bomb. “We don’t need an atomic bomb. We have a great, self-sacrificing and unified nation,” Rouhani said in the city of Isfahan on February 4. Despite Tehran reiterating on a number of occasions that it was not interested in developing a nuclear weapons program, Iran has still been subject to wide-ranging Western and United Nations sanctions. Iran’s oil exports dropped from 2.5 million barrels a day in 2011 to about 1 million barrels in January, according to the US Energy Information Administration (EIA). Iran recently conducted a series of naval drills near the strategically important Strait of Hormuz, which sees a quarter of all sea-transported oil pass through it. Tehran said its defense doctrine is based on deterrence and poses no threat against other countries. During Iran’s exercises, a mock-up of a full-sized US warship was blown up. Iran is keen to assert its influence within the Persian Gulf given the latter’s economic and political importance. Tehran has often said that it is prepared to block the Strait of Hormuz if it ever came under military attack. Negotiations to hammer out a deal regarding Iran’s nuclear ambitions are set to resume in Lausanne, Switzerland, next week. The 5+1 group and Iran are trying to reach a compromise before the final deadline in June. In February, Tehran threatened to resume the expansion of its uranium enrichment capacity if Washington was to introduce any further sanctions against the country. “Naturally, if there is no agreement on the issue [Iran’s nuclear program] then both sides can return back to their previous positions,” said Hamid Baedinejad, the general director of the Iranian Foreign Ministry’s Political and International Security Department, speaking to reporters from the Iranian Embassy in Moscow.